The air conditioning can only operate when the engine is running. Press the "AUTO" button. The "AUTO" symbol is displayed. We recommend that you use this mode, it provides optimised automatic control of all of the following functions: passenger compartment temperature, air fl ow, air distribution and air intake, in accordance with the comfort value that you have chosen. This system is designed to operate effectively in all seasons, with the windows closed. For your comfort, when the engine is switched off, the settings are retained until the engine is switched on again. To prevent too great a distribution of cold air when the engine is cold, the air fl ow will only reach its optimum level gradually. The value indicated on the display corresponds to a level of comfort and not to a temperature in degrees Celsius or Fahrenheit. Press the " " and "
to change this value. A setting around the value 21 enables optimum comfort to be obtained. However, depending on your requirements, a setting between 18 and 24 is usual. On entering the vehicle, if the interior is very cold or hot, there is no need to change the value displayed in order to reach the required level of comfort. The system corrects the temperature difference automatically and as quickly as possible. The automatic comfort programme may not be suffi cient for rapid demisting or defrosting of the windscreen and side windows (humidity, several passengers, ice, etc.). In this case, select the automatic visibility programme. The button 3 indicator lamp comes on. The system automatically controls the air conditioning and the fl ow of air and provides optimum distribution of the ventilation to the windscreen and side windows. It deactivates air recirculation 5 . To exit this programme, press button 3 again or "AUTO" , the indicator lamp on the button is switched off and "AUTO" is displayed. It is possible to adjust one or more functions manually while leaving the other functions in automatic mode. The "AUTO" symbol switches off. To return to automatic mode, press the "AUTO" button. Switching to manual mode may not be suitable (temperature, humidity, odour, condensation) and does not provide optimum comfort. 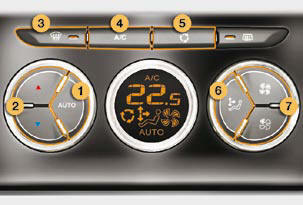 For maximum cooling or heating of the cabin, it is possible to go beyond the minimum 14 or maximum 28 values. Press the blue button 2 until "LO" is displayed or the red button 2 until "HI" is displayed. Press this button to switch off the air conditioning. Stopping the air conditioning may cause some problems (humidity, misting). Automatic operation of the air conditioning is resumed when the button is pressed again. The symbol "A/C" is displayed. Press this button for recirculation of the interior air. The air recirculation symbol 5 is displayed. Air recirculation enables the passenger compartment to be isolated from exterior odours and smoke. Press this button again or press the "AUTO" button to resume automatic management of the intake of air. The air recirculation symbol 5 is switched off. Avoid prolonged recirculation of interior air (risk of condensation or deterioration of the air quality). - the air vents and the footwells, - the air vents. Press the "full fan" symbol to increase the air fl ow. The air fl ow symbol, the fan, fi lls progressively according to the value requested. Press the "empty fan" symbol to decrease the air fl ow. Press the air fl ow "empty fan" button of air fl ow 7 until the fan symbol disappears. Thermal comfort is no longer controlled. A slight fl ow of air resulting from the movement of the vehicle, remains perceptible however. Pressing the air fl ow "full fan" button of air fl ow 7 or on "AUTO" reactivates the system with the values set before it was switched off. Avoid driving for long periods with the air conditioning switched off (risk of misting and reduction of the air quality in the cabin).